Why cats sit on a window perch staring outside for hours! Any cat owner knows that cats love to sit up high and love to check out what’s going on outdoors. Cats love the outdoors, they will sit at windows and stare for hours at a time. They are keeping an eye on whats happening just in case mom or dad would let them go out side. Probably just sitting there and planning the route when the go outside. 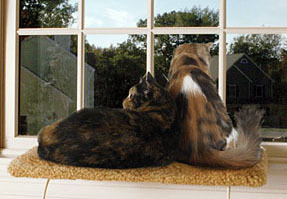 The cat window perch provides a safe and healthy way for your cat to view all the birds and other animals of interest. There has always be a great debate whether one should only keep their cat inside with the opposite side to let there cat go outside. This is a article we will discuss at a later time. However, just let your feline friend take it all in about the outside world and when she does eventually goes out, they will know what to expect, then again, they probably finds it so enjoyable watching the world without going out and probably never will.